We are happy to personally deliver your new Brompton anywhere in the North West. We are happy to consider your old Brompton as part exchange against the new Brompton of your dreams because we specialise in Brompton restoration. To discuss this further contact via email, call us on 0151 733 5507 or pop in with your old Brompton. 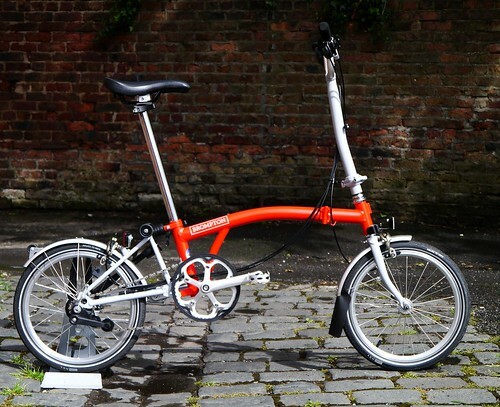 Each Brompton can be custom made to your exact specification. Select from a range of colours, gearing options, riding styles and accessories. The small wheels afford the bike great acceleration and manoeuvrability, ideal for stop-start city riding in traffic. The smaller wheel diameter also increases the strength and rigidity of the wheels. The suspension system and long seat post make the bike comfortable to ride over rough surfaces and for longer distances. Brompton Bikes are available in a range of 12 painted colours, including two-tone. They are also available with a Raw Lacquer over the steel, allowing you to see the craftsmanship of the brazing. At Picton Cycles we have 2 different Brompton demo models available for you to take out for a ride, fold it, unfold it enjoy it. We have a large park just over the road where you can get a good feel of the bike all without the pressure of riding it on the roads. Using the Brompton Custom bike builder you can see the final price and weight of your chosen sepcifications, see how different colours will look together and see what luggage and accessory options are availabe.